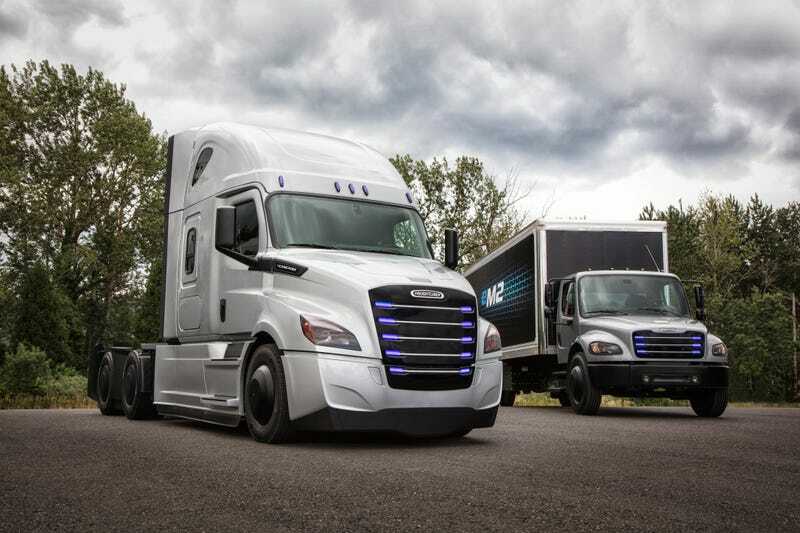 Daimler debuted two new fully-electric Freightliner commercial trucks today, adding to the company’s growing fleet of electric vehicles spread among the Mercedes, FUSO, Freightliner and Thomas Built brands. Thirty total electric trucks, split between the medium-duty Freightliner eM2 106 and heavy-duty Freighliner eCascadia, will be delivered to customers by the end of the year for real-world testing. Other buyers won’t be able to get one anytime soon, as neither vehicle has been priced and Daimler isn’t planning on starting production until 2021. For the few customers that will have access, the stats are promising but not game-changing. The eCascadia can squeeze 250 miles out of its 550 Kwh battery pack, with an 80 percent recharge taking 90 minutes and allowing 200 more miles of travel. The eM2, with its 325 Kwh pack, manages a 230 mile range. That’s noticeably shorter, but 60 minutes on the charger gets you an additional 184 miles of range. Of course, we can’t talk about electric truck stats without addressing the center-seated elephant in the room. These numbers are no match for Tesla’s proposed Semi, which offers 500 miles of range with the same 80,000 pound gross combined weight rating. And with the company’s promised “Megachargers,” the goal is to add 400 miles of range in 30 minutes of charging. Given that Tesla doesn’t currently have a place to build assembly, that seems unlikely at best. The truck is far too big to be built at the company’s existing factories and constructing an all-new facility to build a commercial vehicle is not a small order. That being said, Daimler’s trucks won’t even be available until 2021. So who has the better electric truck plan? In terms of stats, it’s hard to argue with the Tesla. But given the company’s track record, it’s also hard to tell whether we can trust their claims. Daimler, on the other hand, is taking a far more conservative approach that’s focusing on adapting to customer needs. Plus we don’t know the true at-delivery cost for any of the trucks. Regardless, it’s good to know that the fate of the electric semi as a concept isn’t resting on Tesla alone.